Now that we had a nice box of dates as a gift from Tawn’s boss, the only question was, what to do with them? Okay, the premise is a bit misleading. I always have some dates on hand and add them to my oatmeal every morning. And I’m certainly not going to use the expensive, plump fresh dates for cooking – they’re perfect for snacking or stuffing with candied almonds or goat cheese. But the receipt of the dates did get me thinking about ways to incorporate dates into my cooking beyond the oatmeal, so I was inspired to try some Moroccan-themed recipes. Before anyone accuses me of not being authentic, or of using pork in a recipe ostensibly from a Muslim country, let me acknowledge the disconnects. These recipes were more “loosely inspired by the cuisine of Morocco” than anything else. I didn’t strictly follow a recipe – no surprise there – but used one as a guide. I prepared jasmine rice, since it was handy, in a rice cooker with a mixture of half water and half chicken broth, adding a cinnamon stick, some cardamom pods, and some cloves. While it was cooking, I fried a small onion, finely diced, with cumin, tumeric, ground cinnamon, paprika, and chili powder until fragrant, then added chopped pine nuts, slivered almonds, chopped dried apricots, chopped dates (you were wondering when I’d get to that, weren’t you?) and the zest of half a lemon. After the rice was finished, I pulled out the cardamom and cloves, then stirred in the onion, spice, and fruit mixture. I added a little salt and pepper to taste and garnished with some green onions. If I had had some coriander (cilantro) I would have added that, too. 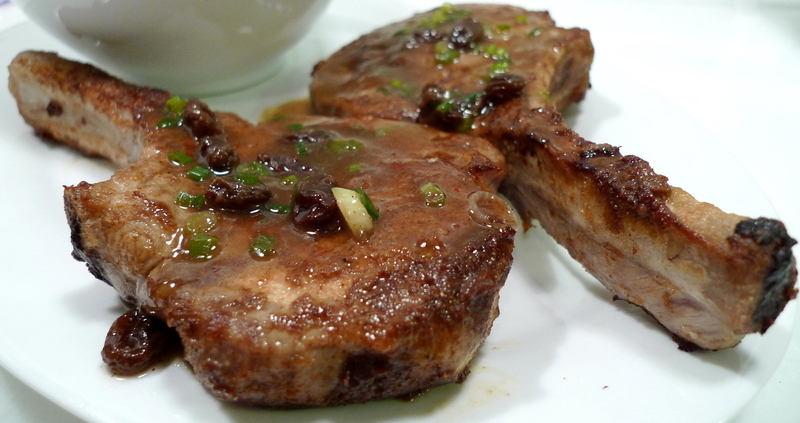 The pork chops (you could use chicken, too) were marinated in a brine of 2 cups buttermilk, 1 tbsp of salt, and a generous dash of cayenne pepper. After two hours, I rinsed the buttermilk off, patted the meat dry with towels, and then coated it with a mixture of flour, brown sugar, ground coriander seed, cumin, paprika, cinnamon, garlic powder, salt, and pepper. Fried the chops for a few minutes to get a crust, and then moved the pan to the oven until the internal temperature reached 160 F. While the pork chops rested on a plate, tented loosely with foil, I made a sauce from the drippings, using chicken stock, raisins, green onions, and a little corn starch as a thickener. This was a tremendously tasty meal and I’ll have to experiment with it further and see what other things I can do with the basic idea. Chicken is next on my list, maybe for a brunch this Sunday. This entry was posted in Uncategorized and tagged African, cooking, Dates, food, Moroccan, Morocco, Pork, Pork Chops, rice by christao408. Bookmark the permalink. Man… that looks good. I’m not a big fan of dates but I would try this dish. Wow, you’re really a genius, Chris! This truly looks good! Looks and sounds quite tasty. Thanks for sharing. drrrrrrrrroooooooooooool!!!!! im always uber impressed by ppl like you and andy (and quite a few of my friends who can really cook/bake and do their magic in da kitchen)…. simply amazing! props! You know I love dates so this will be my weekend recipe. @Fatcat723 – You could probably mix some figs in with it, too! Ha ha…@icapillas – Oh, you’re too kind. No genius here, in the least. @ZenPaper – If your keyboard gets wet (from drool) then I will accept the blame. @ElusiveWords – You could leave the dates out and just use raisins, instead. Or dried cherries. @let_the_right_one_in – You’re welcome. Glad you enjoyed. @Sinful_Sundae – Very kind words. Really no need to be impressed; I think cooking is something that everyone can learn to do and, hopefully, will enjoy doing. Sounds good.The look of the dish overall is very fusion. @Redlegsix – Jasmine rice is a particular strain of long-grain rice that is very fragrant. It isn’t the same as the short-grain “sticky rice” that you are thinking of. You could use any type of white rice (or even whole grain rice) for this recipe, although I think basmati rice would the “authentic” type. I can send you the recipes I used, if you’d like. @yang1815 – Fusion, confusion, Confucian… all the same, lah. @christao408 – Oh yes, please do!!! I will put Pat to work on it when we get back from vacation!!! @christao408 – Haha yes. I guess I meant to say that I would have thought it’s a Chinese dish if I just looked at the photo. Ha ha Chris, you know me so well. 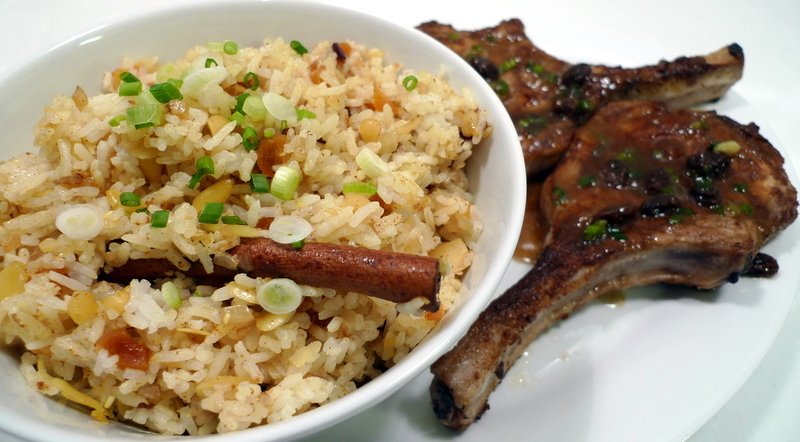 I DID think of the ” moroccan rice with PORK chops ” bit! The rice sounds great. I could make chicken with your recipe.Try to make the date sauce and you can refrigerate the mixture. If you have tamarind paste or fresh packed tamarind you can easily make the sauce. Soak the fresh tamrind in some warm water and squeeze and strain the water into a bowl. It should be thick. You can use a couple of tsp of the tamarind paste and liquify it a little too. Grind a hand ful of dates ( four to five ) into a smooth paste, and add to the tamarind paste. You can add cinnamon, black pepper, and a pinch of mace to this misture and stir well. Some people add a tsp of brown sugar to it. With the dates from SA or Dubai, I don’t do that, because they are very sweet by themselves and the tartness of the tamarind compliments the sweetness very nicely. You can make sugar or chocoalte chip cookies, and pancakes too, and add pieces of dates to the dough. Really delicious results Chris. @christao408 – “Fusion, confusion, Confucian… all the same, lah. ” LOL!!! LIKE! I’m so hungry now…and dinner is awhile away. 😦 I’ve never brined anything but maybe I should give that a go one day. @Redlegsix – Okay, will send today. @TheCheshireGrins – Thank you. Will make it for you and Phil when you visit. @brooklyn2028 – Brining is a good technique especially with North American chicken and pork, which tends to be lean and flavorless. @ZSA_MD – Oh, those are FANTASTIC suggestions, thank you. Of course we have tamarind galore here, so I’ll try that. Am going to make this again this weekend, but with chicken, for some guests. @yang1815 – Well, Tawn’s 1/4 Chinese, if that helps. @Sinful_Sundae – Glad you liked. YUM! but if i were you, i’d eat the dates as they are. ’cause they are DAMN EXPENSIVE. @rudyhou – Oh, I don’t use the expensive fresh dates for cooking. I save those for snacking. The cooking dates are the dried ones. I was watching Martha Stewart last week and saw Tawn’s picture on National TV. I think it was a re-run but she was talking about her adventures in Thailand and showed some pictures. It was so cool!!!! !